I’ve felt chronically cold since I was a teenager and I know there is deeper work I need to do to maintain and continue warming up. But for now I am encouraged by the little progress I have noticed from these few shifts! To make the elixir I just throw some fresh turmeric and ginger pieces in my blender with hot water and then strain. I usually add some tallow, cinnamon, black pepper, and a lil honey or maple syrup. Today I added astragalus, burdock, and dandelion infusion leftovers from yesterday. This week has been a bit of a whirlwind for me. One week ago I experienced the deepest processing I've ever had during a therapy session. I feel immensely grateful that my internal work is a continuing process of forever excavation. It ALWAYS feels as if I have really reached the core this time and then *surprise! * there's yet another layer, another layer, another layer. And every layer has arms that reach out and touch all the other layers both into future Kathryns and back, back to my earliest memories, back to my birth, back to previous lifetimes. It's not exactly a peeling away process so much as it is an integration process. I cannot say enough about the wonders of hakomi psychotherapy! Hakomi has been a part of my life for the last 12 years in one way or another, including a year long training I finished in last December. If you plan to dive deeply into work with poisonous plants I highly, highly recommend you find yourself some kind of body-centererd psychotherapist, breathwork facilitator, or anyone who understands that trauma is stored in the body and that you are already whole, there is nothing wrong with you, nothing to fix. Mars has been on top of my natal Mars the last few days (my natal Mars is in Aries retrograde) and wowza - this must be what it feels like to be an extrovert. 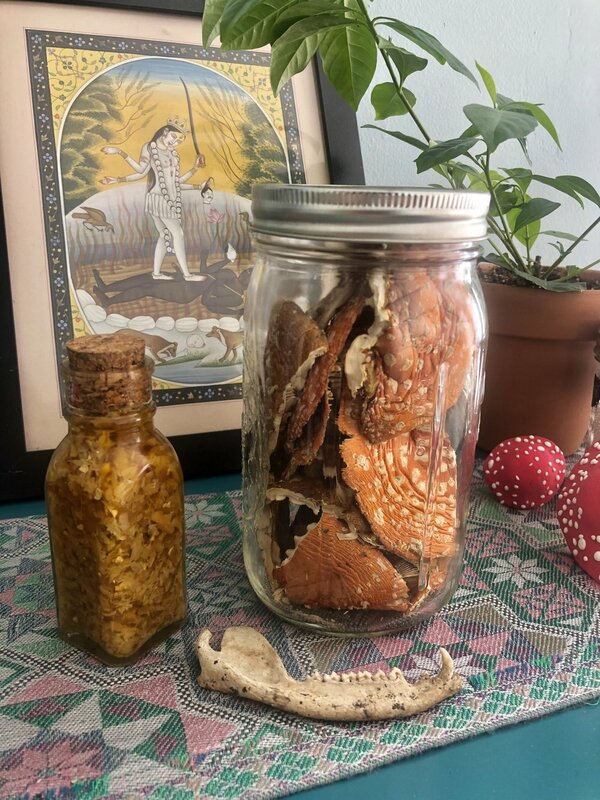 It was exactly conjunct the day I had my first of the Poisonous Plant Medicine classes at Anima Mundi and I don't think I stopped talking for a solid 5 hours (not my normal mode of operation fyi.) It was such a joy to be in that space and I am really looking forward to our future meetings :) If you are in Brooklyn, you can still drop-in to any of the classes! Pictured above is a dried Brugmansia flower I recently spotted at the Roger Williams botanical gardens in Providence. Brugmansia is a spectacular plant that we will discuss in week 3 & 4 of the series. Plant spirit communication is the practice of using our intuition to directly connect with plants. This is in diametrical opposition to capitalistic, material reductionist herbalism that dominates the plant medicine world. Instead of asking what you can get from a plant, we directly ask the plant what they want to share. This allows us to experience the energies of plants without having to ingest or even be in the same vicinity of a plant. This is a skill that everybody can develop! “Poison” as medicine is the spine of my work with poisonous plants. Why do so many consciousness shifting plants make us feel physically ill? What can we learn when we balance the typical “light and love” approach to spiritual paths with shadow integration? What if the majority of the suffering we experience is not from the things we are afraid of, but from our avoidance of those things? Week 1 of the Poisonous Plant Medicine course will introduce the cornerstones of this series. If you can only make it to one class, make it this one! Week 1 for the online course is sold out for the January 20th group but there are still spaces available for the February 10th group! Tomorrow night will be the first class at @animamundiherbals and I can’t wait! This essence was collected from my personal aztekium ritterii cacti. I’ve been living with this cactus for almost 4 years and in that time it has only flowered once. It bloomed during a full moon in Pisces with the flowers only lasting for 2 days. I created this essence from that special bloom. Instead of the traditional solar infused essence, I left this one out to bask in the glow of the full moon surrounded by large pieces of black tourmaline, amethyst, clear quartz, and rose quartz. In Mexico, Aztekium ritterii is called “Peyotillo.” However, even though it contains mescaline, there have been no ethnobotanical reports that state that it has ever been used by natives. On a personal level I’m working on processing some deep trauma I unconsciously thought I could avoid and stepping more firmly into the role of adult and teacher in the world. Last night I pulled the 6 of pentacles as my card for 2019, so I’m sitting with the possibilities there. My card for 2018 was The Empress and that was certainly a major theme over these last 12 months. Every year I think to myself, wow that was the most transformative year of my life, I bet things will settle down now. Lol. It never does. And I’m realizing I don’t really want it to. I don’t think there’s an end point to inner work and a big part of my work now seems to be accepting that more fully. Things do get easier though. I become more myself, more mature, wiser, more relaxed, and more content with each passing year. I feel grateful for the Kathryns of years past that did their work so that I can be the Kathryn who is here now. I often wonder what I will reminisce on when I am at the end of my life and I think it will be facing my shadow, facing my Underworld, and doing the painful work just as much or more as it will be the good times and the laughter and the peaks.